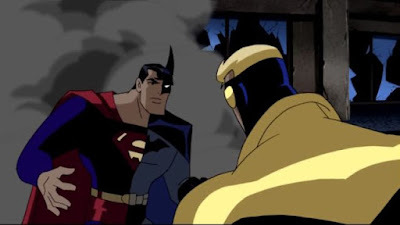 This is no more apparent than in the Justice League Unlimited Episode "The Greatest Story Never Told." The fact that the title is a takeoff of "Greatest Story Ever Told" should already be a tip-off that this episode is going to be a Batarang of spiritual truth. Our hero, Booster Gold, fancies himself the greatest hero in history. And according to his robot side-kick Skeets, he is. Truth be told, though, he's simply a football washout from the future who stole some super-power gear and traveled back in time so he could play hero and be famous. He wants to be up there with history's all time great heroes, but his desire for fame, glory, and riches gets in the way of him doing any actual good. And it annoys Batman. You don't ever annoy Batman. Too often Christians see the very famous preachers of mega churches or world renowned evangelists or even Christian recording artists who become crossover successes, and see an impossible standard to meet. We look at our own meager efforts and think that we're failing because our faces aren't adorning the dust jackets of New York Times best-sellers. And if I tell you that I'm not one of those envious Christians, I'm a huge liar. Here I am writing a small blog, thinking that I should be a lot more famous, important, and influential than I am. I am Booster Gold. (I'm not from the future, because if I was, hello Lottery!) I get where he's coming from, and I sometimes have a hard time realizing that I might never be the kind of Christian writer and speaker who sells out stadiums. Of course, one lesson I am continually learning is that God has a far different definition of "important and influential." In the episode, a crazy, magic slinging sorcerer threatens the world, because apparently Netflix changed their pricing structure and that was the final straw; the world had to die. (I mean, what really motivates all these crazy super-powered types to just go nuts and wreck a city? That's a whole other article). Anyway, Booster thinks he's going to fight with the big boys, finally prove to the world that he's a hero who means business. Instead, he is assigned traffic duty to make sure people escape to safety. I'm convinced super-villains own stock in plate-glass companies. What Booster doesn't get is that his job is just as important as Superman's. In fact, it's more important, because the reason Superman, Batman, and Wonder Woman are putting their lives on the line is to protect the innocent. If Booster doesn't make sure that the people escape before the bad guy obliterates the city, then the heroes are fighting in vain. He's got the most important job. This is how God thinks. This is why Jesus taught that the meek will inherit the earth. The meek and humble are the ones who truly change the world. When we think of civil rights, we automatically go to Martin Luther King. But while King was a great man and played a huge role in the struggle, he didn't do it alone. It took everyone who marched, protested, sat in, and fought for equality who made it happen. We don't know most of their names. They were the meek, and they were able to inherit a better world. I also struggle with this idea. I feel like I'm on traffic duty and missing out on the big things. I teach community college and tutor students on the SAT. I feel like I could be doing so many greater things, but perhaps in God's eyes, I am doing those greater things. Maybe I'm exactly where I'm needed, making a far more lasting impact than I would otherwise. Through every student I teach and every person I meet, I could be making a world-changing impact and not even know it. 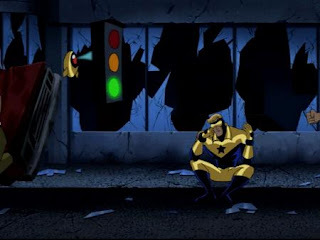 In Booster's case, it's a good thing he was directing traffic. He's the only one who knows about a second, more deadly threat. One of the buildings damaged by the villain's efforts to drive down property values is a top secret research lab. Long story short, what was a perfectly contained science experiment is now a roving black hole set to engulf the entire world. Let's build a black hole in the middle of the city. Again, we see God's priorities over man's. We think that to save the world we have to be front and center, when sometimes the problems are in the back, where the big boys don't go. Those on the bottom rung are often closest to the very real hurts, troubles, and turmoils that could very well engulf the world. Every time they reach out in love, every time they extend a helping had, they may very well avert disaster by changing one life for the better. And no one will ever know. 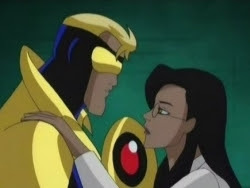 In the end, Booster finally gets to be the hero and rescue the girl, but only she knows that he saved the world. It's a humbling experience, but one that he learns from. He finally realizes what's truly important in life, and what it means to have the gifts you have and use them where they are needed. He may never be Superman famous, but that's not what being a hero is all about. This isn't anything new. Jesus rebuked hypocrites for doing all their good deeds in public. He said that you are truly blessed if you pray and do your acts of charity in private. After all, publicity muddies your motivation and corrupts the good works. When it's private, it means something. I'm sure this also includes saving the world. My wife and I used this episode to teach a Sunday School class. And no, it wasn't a children's class, the average age was thirty-five. And they loved it, because the clear, spiritual truths spoke to them in a way they'd never considered. Yes, what you are seeing is straight out of the Bible. This again is why geekiness is Godly, and why we don't need to sequester ourselves from the world so that we are only exposed to "Christian" things. God's truth is everywhere, and we just have to be willing to listen to everyone, even people wearing impractical spandex.